My family took our first vacation out of state; and we went to New York, which is quite a long trip for these Northern Californians. It was a whirlwind tour of 5 1/2 days, ending (sadly enough) the day before Male Pattern Boldness Day. And I didn’t have time for the Charles James exhibit at the Metropolitan Museum of Art. Our wish list of to-dos was far longer than we could accommodate. 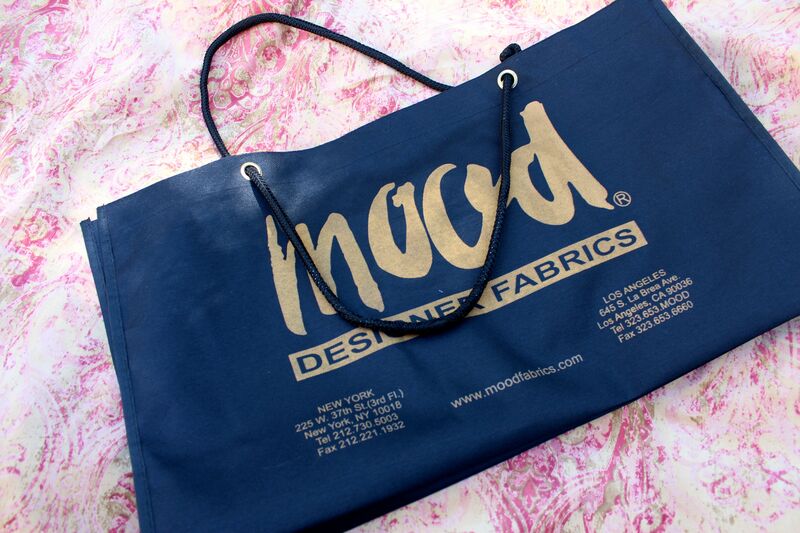 But I made sure I went to Mood Fabrics. I’ve read about Mood on various sewing blogs, and one of the sewing magazines recently had an article on fabric shopping in New York and listed it as THE place to go if you only had time for one store. And it was just a few blocks south of our hotel near Times Square. The entrance to Mood is on the third floor of its building, accessible by an old-fashioned elevator. And by old-fashioned, I mean it required an operator, who was wearing a uniform with a hat. He closed the door, then the flexible brass gate, before using a brass lever to engage the mechanism that lifted us to the third floor. Cool. Once leaving the elevator, I stepped across a hallway and into Mood. A friendly woman at the door checks large bags and backpacks (but not purses). Mood is 40,000 square feet of fabrics on three floors. There is amazing fabric everywhere you look. The fabric is on long tubular bolts, mostly stacked horizontally, with the ends sticking out of racks upon racks of industrial shelving. Thank goodness I went in with a game plan. Otherwise, I may have been too overwhelmed to buy anything. And I may have fainted in the Suitings section, which was enormous and, well, dreamy. But my plan was to come home with three cotton prints (which I expected would be among the least expensive fabrics), so I was able to concentrate on just a few hundred bolts in one section. And that area did not include shirtings, which was across the aisle and down a bit. There were a few hundred of those as well. 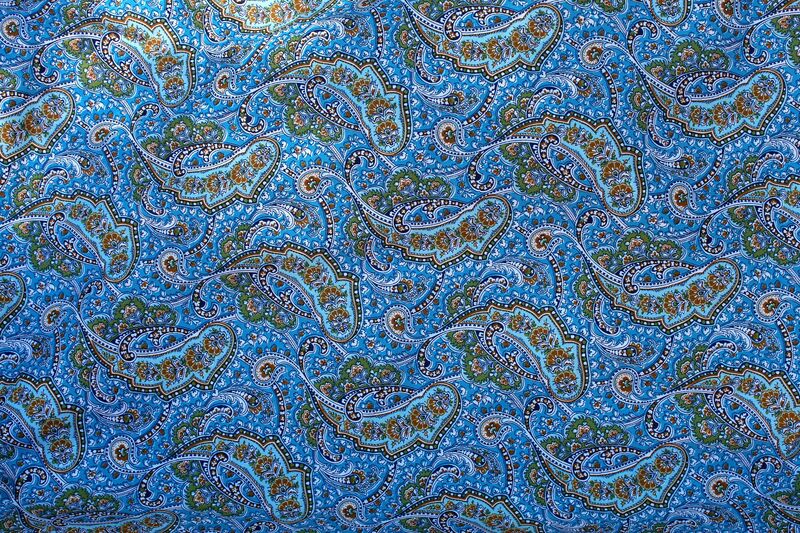 Paisley from Mood Fabrics — 56 inches wide. 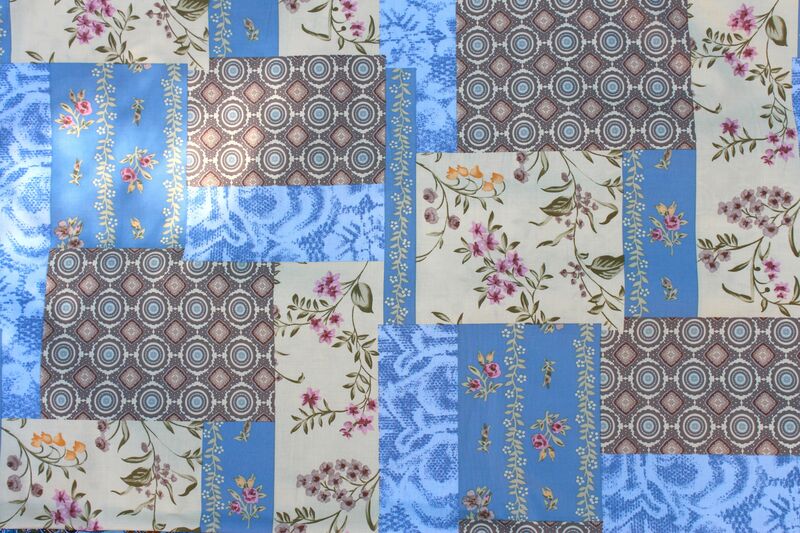 Patchwork from Mood Fabrics, 50 inches wide. I kept trying to walk away because I had no idea what I’d do with it, but it kept calling me back. It has a home dec look about it, but it’s dress weight. I bought 3 yards (50 inches wide). 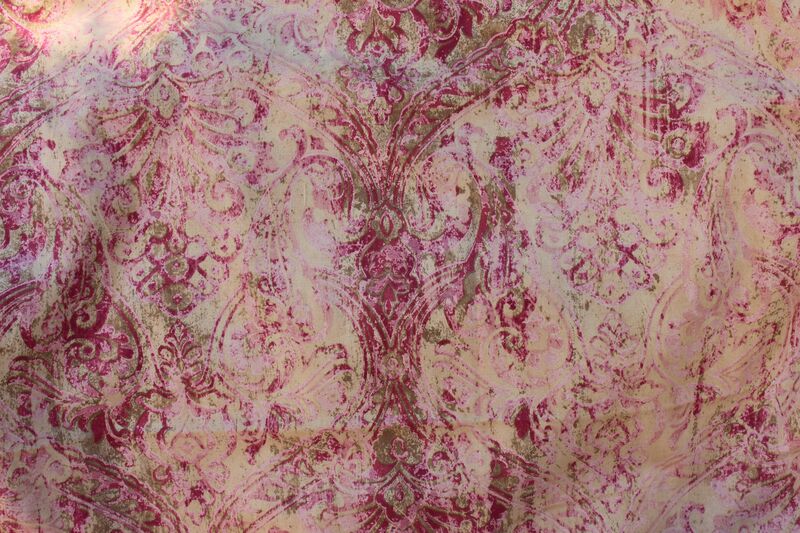 Faded damask from Mood Fabrics, 58 inches wide. I could see this as a dress with my tall riding boots, a great skirt-and-jacket suit, or a fantastic coat, so I got 5 yards of this also. Although I do think it would be smashing on (and heavy enough for) a chair slipcover. 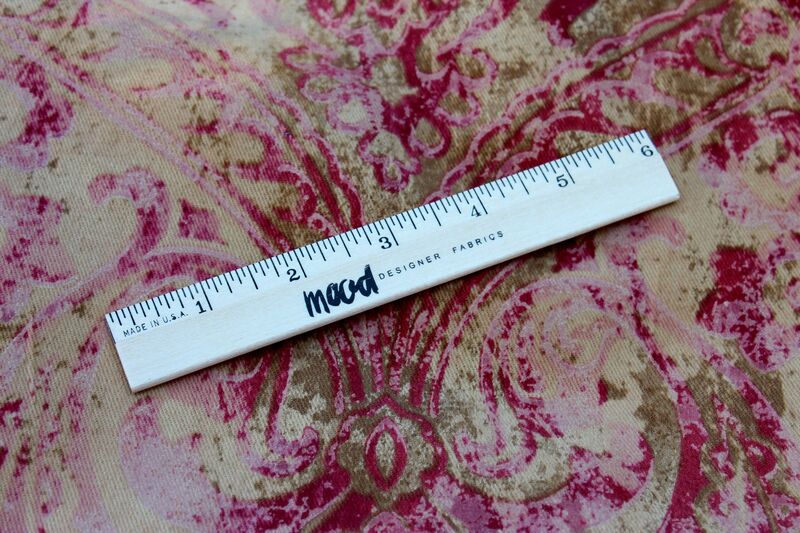 I’ll keep this on my sewing desk with my seam gauge and seam ripper. They placed my fabric in a nice Mood plastic bag with handles, then put everything inside this really nice bag that’s stronger than a typical reusable grocery bag. I’ll be keeping it forever as a badge of honor. The fabrics I bought were all in the $12-$15-a-yard price range. Yes, it’s more than I’ll probably ever pay per yard at Jo-Ann’s, but how often will I get to go fabric shopping in New York? And, as an unexpected bonus, garment fabric (as well as clothing) is tax-free in New York City. By the way, Mood has just opened a store in Los Angeles. I’ll be taking my daughter to Southern California next year to look at colleges, so I’ll have to see if I can sneak in a side trip. I wanted to keep my focus on buying fabric, so I didn’t take photographs of the store; but this video is an excellent representation of what Mood Fabrics is all about. I recommend a visit if you are ever in Manhattan. We were right down the street from Mood and I didn’t even think to go. Dang. Mark wants to know if you saw Swatch. Sorry, I didn’t see Swatch. I hadn’t even heard of him until another friend asked me the same thing!